I’m sure if we try really hard, we can spell the word M-E-L-O-D-Y using letters from the names of Sauti Sol’s band members. As you know, these four talented young men launched their new album last weekend; Live And Die in Afrika. Apart from the songs you know, the songs that have won awards and those that have been played at numerous office parties and even in State House, there are a few new gems to discover in this 15-track compilation. One of those is Kuliko Jana featuring Aaron Rimbui, something akin to a victory speech by the band. I picked that one first because it’s described as an honest prayer by the musicians. “We have come from so far, overcome so many obstacles to get here. Kuliko Jana is the deepest song in the album for me… It depicts our story, our song…” says the man Willis Austin Chimano, stressing that it was a simple thank you to God for seeing them through and a plea that He would continue guiding them as they journey on. Another one is Number 9, Kiss Me. Written by the lyrical genius also known as Bien Aime. It is what you think and then some more. I had the jam on repeat almost all of Monday and it earned me a few concerned looks in Mbagathi Way traffic. My car volume never goes higher than 20, but I was singing along loudly at 23! Mudigi Savara and Chimano called me a “woiye woiye chick” for liking it, (and Isabella) but it is easily the most romantic track of the bunch. Not Nishike. Nishike is not romantic in case you were mistaken. Nishike is just the kind of song that you have to work out hard for three months for, and wear African print pants just to dance to it. Even in your digs. For Polycarp Otieno (the L and Y), the title track Live and Die in Afrika is his favourite. He played a big part in picking the album name, way before all the songs were ready and the message is as profound to him as can be. “Life can happen in Africa, all aspects of it. Africans also dream of being rich and famous, they want to have lots and lots of money and spend it the way they want. These dreams can be achieved right here on the continent, and not necessarily in the countries we see in the movies. We can make money, not in the conventional it’s my turn to eat kind of way. Not in the fleece as much as you can kind of way. But legit; the way it should be. 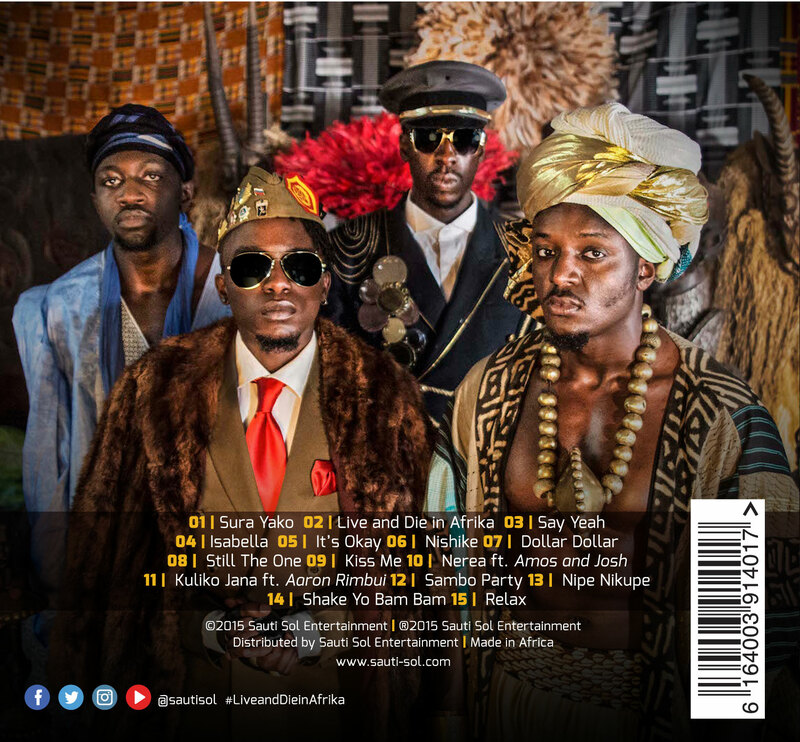 Sauti Sol’s new album Live and Die in Afrika speaks of ordinary things that happen in Africa, the unique factor being that they actually just happened in Africa. Imagine if all you ever needed was on this continent, either physically or hypothetically. Do you have the confidence to make it happen in Africa? To tell a good story that has come out your struggles? Sometimes all we need to do is step back and appreciate it. Be proud of it. Of being in Africa. It shouldn’t be too hard to achieve if you put your mind to it. Just to look human, let me conclude by saying that Shake Yo Bam Bam is still my least favourite track in this album. You can’t please us all hey? Good job guys! Get part of the album on iTunes, as you wait for an upcoming collabo album featuring artists from across the continent, including the likes of Mi Casa, Vanessa Mdee, Alikiba and more. I can’t wait to listen to the album.